This is for flagging posts. I'd like to encourage people to think about when to use it (and when not). The purpose of the system if to make the forums almost self-moderating. For example three flags on a post triggers a PM to the poster (and hides the post). 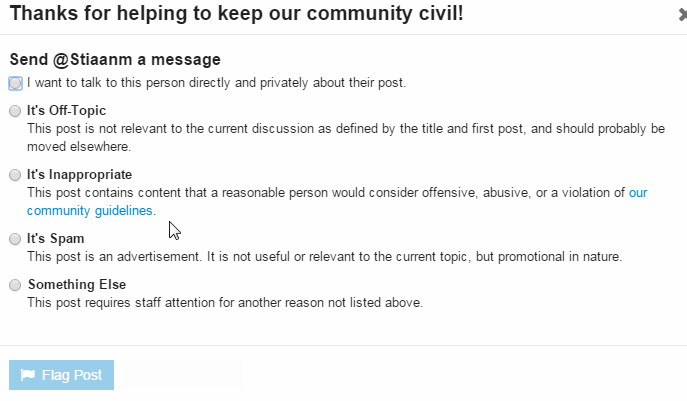 They can then edit/move their post to make it appropriate which means no mods got involved. Without any mod involvement! Makes it easy to identify problem posts and action them. Post is in the wrong category (e.g. classified not in classified section, or other material that should be in the wugger only section, or anything else that is obviously in the wrong category). When a reply really is off topic from the specific thread (i.e. needs to be split off to new thread). Reviving of old old threads. When the post is not in line with our constitution or rules. Post contains content that a reasonable person would consider offensive or abusive.. When you don't like the poster. When you don't like what he's saying. When you don't like how he or she is saying something. You are unhappy a transaction (or lack thereof) based on a classified on the forum (See this post). The first option alows you to PM the person about this topic. This should not raise a flag. The second should be used for posts in wrong category or off-topic for the thread. This is something that's OK but in the wrong place essentially. Inappropriate is for posts that are just wrong. E.g. not in line with our rules, guidelines etc. I.e. anything that should not be anywhere on our forums. Marking a post as Off-Topic, Inappropriate or Spam will trigger a moderator notification so @moderators may review the issue in their flag queue. They can either agree or disagree with a flag. The defer action actually means ignore (don't agree or disagree) but it closes the flag for further raction. If a moderator is unsure about what to do please leave the flag open. A post with 3 flags will be automatically hidden. A staff member can use the "Take Action" button, which will cause this to happen immediately. When a post is automatically hidden due to flags, the user receives a PM informing them their post was flagged. After 10 minutes, the user may edit their post and it will be unhidden. If another 3 flags occur, the post will be hidden again and editing will not unhide the post. A new (trust level 0) user whose post is flagged as spam 3 times from 3 different users will have all their posts hidden as a result. If after 48 hours a flag is still in the flag queue without any action taken, an automatic mail will go out to @spin . A topic with 12 unresolved flags from at least 5 different users will be automatically closed until the moderators can intervene. Flags that @moderators don't agree with will affect the flagger's trust. So don't get flag happy.